The PSU300 Series has been discontinued. Please see the PSU505 as a possible substitute. 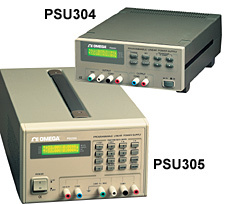 The PSU300 Series comprises power supplies with voltages from -30 to 30 Vdc, power levels from 30 to 165 W, and constant current from 0 to 3 A. Standard features include RS232 communications output, LCD, sophisticated cooling system, and software calibration. 참고: Comes with power cord, fuse and complete operator’s manual.